So we made it--my two youngest just got promoted out of their Beginner class at church, and into Kindergarten. I'm relieved, mostly because I don't have to stay in class with them now, but also because of the Sabbath Theme program. Maybe you know it--the program where kids learn about how we cook and clean on Friday, and then have the perfect Sabbath day. I've been through that program with three kids now. On the one hand, it's sweet to sing the songs and imagine a perfectly cleaned house, and all the idyllic Sabbath activities. On the other, I can't help thinking my church is officially teaching my kids that I am failing. We have the other Sabbath rest. Friday night-- It's January, so Sabbath begins at supper--soup and rolls. Like most meals, it's loud and fussing happens, but for Sabbath we have a strategy. Jim plays praise music on his phone and streams it through the TV. I can't say it necessarily soothes the children, but at least it gives the feeling of some sort of order and meaning above the chaos. It helps me, if no one else. I did some house cleaning this week, so as it grows dark outside, I try to focus on the freshly vacuumed carpets, and not look closely at the floor under the dining room table. I light a candle, too. I remember my father doing it when I was a child. I remember back in our early marriage, when we could create whatever sundown experience we wanted. Now it's mostly about putting a kind of Sabbath spin on the daily chaos. Bedtime--The bedtime nod to Sabbath is that we add in a little singing to storytime for the younger ones. I love the peaceful feeling after the children are all in bed, but I'm not going to enjoy it for long. Without the usual entertainment or work, we're going to fall asleep early. This is one of the best parts of Sabbath--actual rest. Morning--At 6:30, the twins' light-up clocks turn green, making it officially morning and time to get up. 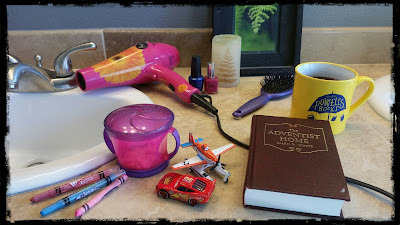 I get dressed and put on makeup before heading downstairs for breakfast--I don't want a repeat of last week when I realized on the way to church that I had forgotten the makeup. Breakfast is cereal, for convenience, but I add in veggie sausage as a Sabbath perk. While I wait for the slow eater to finish, I get a mix out of the pantry and make a crumb cake for Jim's adult Sabbath School class. I have accepted that these things just won't all get done on Friday. J (4yrs) wants to wear the clip-on tie he got as a hand-me-down. I can't help feeling that we're failing to pass on our values as I find him a button-down shirt and teach him to tuck it in. Once dressed, he announces he's going to preach today. Jim leaves first, to check in with the worship coordinator, set up his classroom, and generally be there to solve people's problems before the services start. I put on Veggie Tales while I pack the Sabbath Bag with snacks and entertainment for church. At church-- Once I drop off the twins at their classroom, I'm free. Ish. I haven't figured out what to do with my freedom yet. I might volunteer as a sub for the children's classes. But today I need the time for other things. I hunt down paper and make photocopies for a sign-up sheet in the lobby, and then go to a short meeting that ends up filling the rest of Sabbath School time. I miss the end of my children's class, so I have to find the younger ones and run them to the bathroom one at a time, and we get into the worship service a little late. J wants to see the snacks right away. I am unashamed of our church snacks. They are going to have lunch at least an hour later than their usual schedule, likely more, and spend that time in public. I'm going to do whatever I can to keep us sane and civil. During praise time, A wants to be held because I'm standing up. I don't mind, because it gives me an excuse to bounce with the music. I'm going to be totally lost when I don't have a child as my excuse anymore. About 8 minutes in to the sermon, one of the 4-year-olds announces a serious need for the bathroom, so we miss the middle of message for what turns out to be a false alarm. I get back in time to discover that Jim's closing illustration is about the first time I kissed him. I usually sign off on these things ahead of time, so I'm doubly surprised, but at least he always makes me sound good. After church--I take the kids home and feed them, but Jim has to stay after for a worship seminar. We eat lunch in our church clothes, mostly because it's so late, I don't want to delay the meal long enough to change. J drops cake crumbs on the floor, and I decide it's urgent enough to sweep on Sabbath, even without company coming over, to avoid tracking them around the dining room. When the food is cleaned up, and I'm finally dressed down, it occurs to me how tired I am. It's time for Veggie Tales again. When summer comes, we will spend these afternoons on church hikes, hoping to convince our kids that Sabbath is not lame. But for now I'm grateful to pull a blanket over me in the recliner, and let the little ones climb on my lap. They won't sit still long enough for actual napping, but I close my eyes and remember to enjoy the fact that they are there. This is almost Sabbath rest. A while later, I get a text from Jim saying he's headed home. He has a couple of hours to eat and regroup before his Men's Ministries Social this evening. For a couple of hours we're going to be together, and at home, with nothing we have to do. A little gap of family Sabbath time. We may not replicate the Sabbath School songs, but it counts. And it's enough. I like your blog. Keep them coming :) Havinf little ones is so tough, especially trying to "keep" the sabbath when we're so tired. I just started a full time job in September last year after being a SAHM for a long time and we haven't even made it to one sabbath. 😕 I get worried but it's exhausting. Another pastor's wife with young kids here.....the struggle to make Sabbath special and memorable is real (memorable in a good way, btw). I appreciate your honesty.